Before moving to Cook County about 10 years ago, I spent every long weekend and vacation I could spare in Cook County. The time of year did not matter. All that mattered was getting out of the big city and find some solitude. I bought all the hiking books I could find and searched out trail maps. In recent years I spent a lot of time on the internet looking for more trails. As I was looking at the different maps, I realized I could find individual maps of the Superior Hiking Trail, Border Route Trail and others. I could go to the MN DNR site and print out individual maps; the same with the National Forest Service. There were maps of the county but they were mostly road maps or canoe maps. None of these showed which roads to get to the trail heads or where one trail is located in perspective with other trails. When I opened Stone Harbor Wilderness Supply seven years ago, customers would ask us where to hike. We usually marked up a free map or the Cook County map, which again is a road map. We poured over canoe maps but roads were hard to find on those maps, so we had some trails marked but it was still difficult to show how to get to the trail heads. And to show the entire county, we had to sell a combination of several maps that were great for canoeing but not so good for hiking. 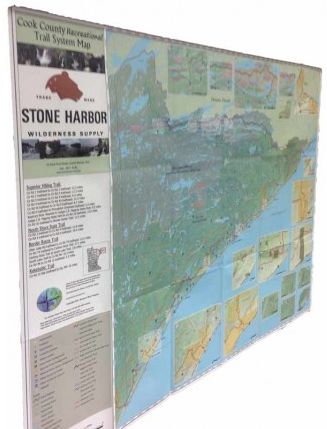 A few months ago I started working with Tony Kroska of the Bismarck Map Company out of Duluth. He listened to my tale of woe and came up with what I feel is the most comprehensive hiking map available for Cook County. We tried to list most of the hiking trails in the county. Over the next couple of months we may find that we may have missed a couple of trails. If you have a favorite, or not so favorite trail that we missed, please let us know so we can add it next time. In the meantime, pick up a copy at either our store or eCommerce site. There are a number of retail stores in the county who are also carrying it so stop in at one of the local shops and ask for it. At $14.95 it is a heck of reference, if I do say so myself.